Barcelona’s run of poor form in La Liga continues, with Valencia holding Ernesto Valverde’s players to a draw at the Mestalla. Valencia took the lead in the second minute, when Ezequiel Garay tapped home at the back post following a poor clearance from the visitors. 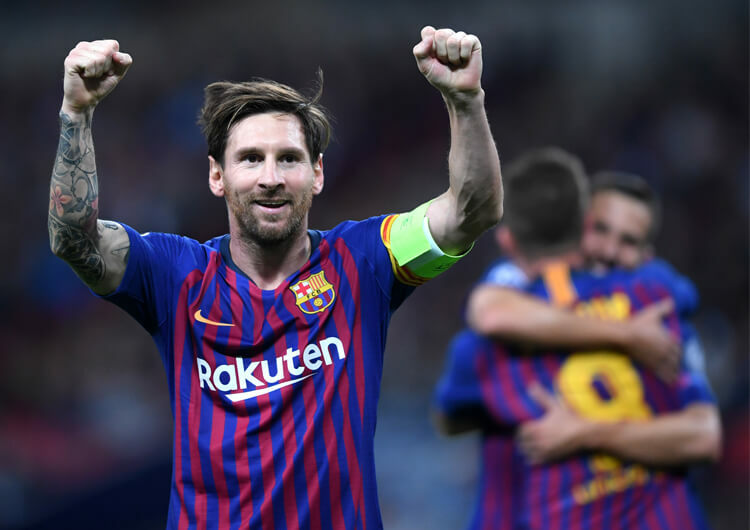 Despite Lionel Messi equalising with a fine finish from 20 yards midway through the first half, Barcelona couldn’t get their noses in front. They have now taken only three points from their last four games, ceding top spot to Sevilla in the run-up to the international break. 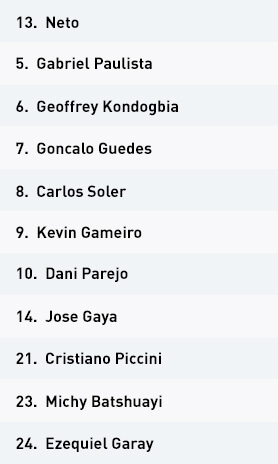 Valencia set up in a 4-4-2/4-2-4 formation in possession, with Michy Batshuayi and Kevin Gameiro leading the line. The midfield four was comprised of Carlos Soler, Dani Parejo, Geoffrey Kondogbia and Goncalo Guedes, who was replaced by Denis Cheryshev in the 12th minute due to injury. The hosts recorded only 28 per cent possession during the game, so the majority of their attacks came through quick counters upon regaining the ball. When they did build, the positional structure would look like a 4-2-4. Soler and Cheryshev would push high and wide on both wings to support Gameiro and Batshuayi in attack, while Kondogbia and Parejo would stay deep to recycle possession, helping to distribute from the defenders and providing security if the ball was lost. This security also allowed full-backs Cristiano Piccini and Jose Gaya to advance more and offer extra support to the attacks. They tended to favour their left-hand side to attack, looking to get the ball out wide before delivering early into the box – but there was variety in their play, too. Occasionally, they would play out from the goalkeeper or go direct, aiming for Batshuayi to win the first ball while the remaining attackers would be positioned nearby to collect the second ball. 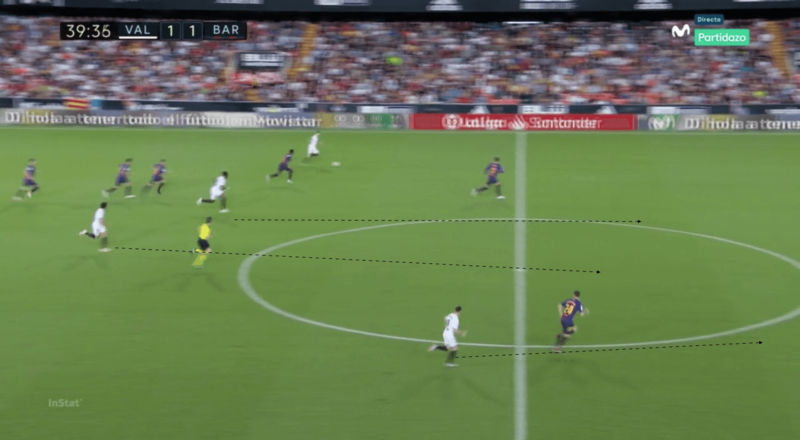 Other times, they would play short to the defenders, enticing Barcelona’s high press towards them before trying to exploit the space between and beyond. They operated in a 4-4-2 mid-block out of possession, with Cheryshev, Kondogbia, Parejo and Soler playing ahead of a back four that contained Piccini, Ezequiel Garay, Gabriel Paulista and Gaya. They would occasionally press Barcelona when the visitors attempted to play out from the back, but the mid-block – which was exceptionally organised – was much more frequently used. They looked to limit spaces between their defensive and midfield units by maintaining vertical compactness. 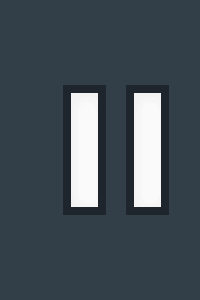 There would be about 10-12 yards between the units while space would be left out wide for the Barcelona full-backs to ensure horizontal compactness – this compactness made it very difficult for the chief threats, Lionel Messi and Philippe Coutinho, to drop in between the lines and get on the ball. Only when the visitors crossed the halfway line would Valencia go near the ball. Batshuayi and Gameiro would press the centre-backs and maintain a close distance between themselves to discourage Barca from playing through. Kondogbia and Parejo would press Ivan Rakitic, Sergio Busquets and Arthur when they gained possession, trying to prevent the midfield trio from turning and playing forward. Cheryshev and Soler, meanwhile, were important in screening the ball from going into the feet of Barca’s wide forwards and being in a position to affect the full-backs, should they gain possession. 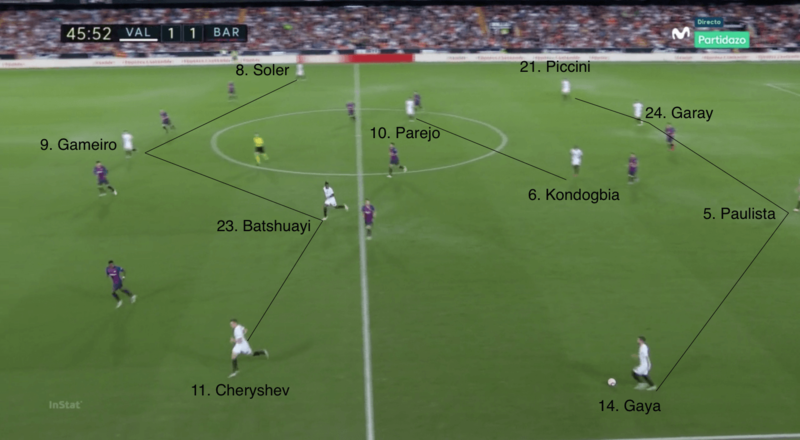 When the ball was delivered to the full-backs, Cheryshev and Soler would close them down while still trying to screen the pass into Messi and Coutinho – this was harder to perform when the pair dropped deeper, resulting in Kondogbia and Parejo helping out. The role of these two central midfielders remained vital when the ball went to a full-back or a wide attacker in a good position; while the back four would drop towards goal to deal with a cross in behind, Kondogbia and Parejo would patrol the edge of the box to screen and obstruct any cut-backs to players holding back or arriving late. 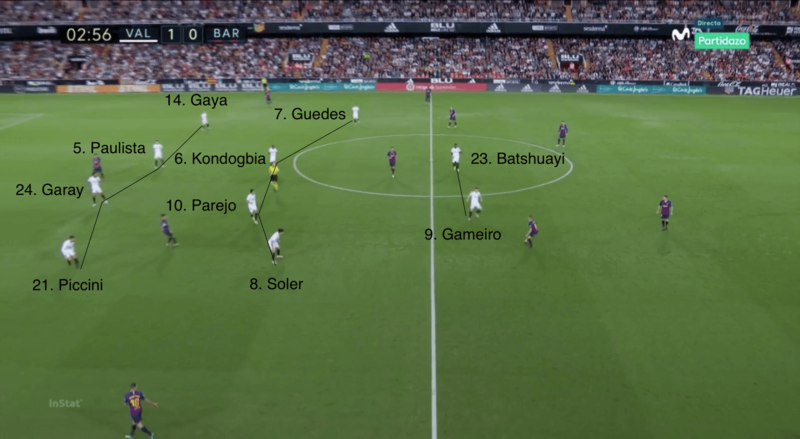 Valencia set up in a 4-2-4 structure in possession, with Denis Cheryshev – who replaced Goncalo Guedes early on – and Carlos Soler supporting Michy Batshuayi and Kevin Gameiro in attack. Valencia used a very organised 4-4-2 mid-block out of possession, and would try to prevent Barcelona from playing through centrally. 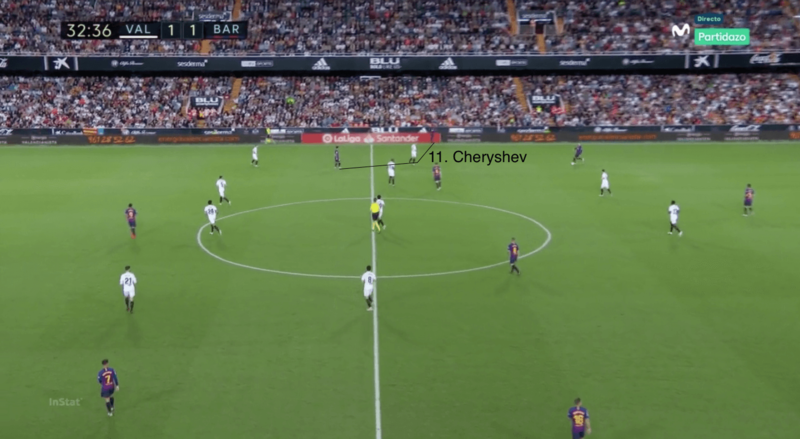 The wide midfielders’ role in the block – here, Cheryshev – was to screen the ball into the feet of Barcelona’s wide attackers while being in a position to affect the full-back, should he gain possession. Valencia’s main threat in attack was through quick counters upon regaining possession. Barcelona set up in a 4-3-3 in possession, with Philippe Coutinho, Luis Suarez and Lionel Messi leading the line. Barcelona used a few different methods out of possession. 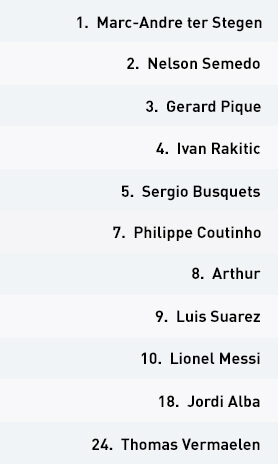 One of these was a 4-4-2 mid-block, where Coutinho would drop in alongside Arthur, Busquets and Rakitic to form the midfield four. When building down the left, Arthur would often take on the role of a false full-back – this enabled Coutinho to drop in to the midfield space and try to get on the ball. Messi had very little space to operate in between the lines. As a result, he soon began to drop in front of the midfield block to pick up possession. The close distance between Barcelona’s midfield three made it difficult to stretch Valencia out. 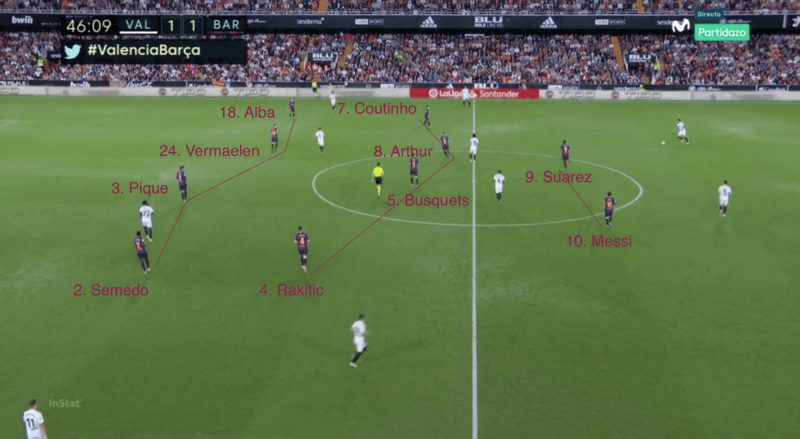 As a result, it was hard for them to increase the space between units and individuals for Messi and Coutinho to drop in and influence the game. Barcelona set up in a 4-3-3 formation, with Sergio Busquets, Ivan Rakitic and Arthur as the midfield three operating behind Lionel Messi, Luis Suarez and Philippe Coutinho. 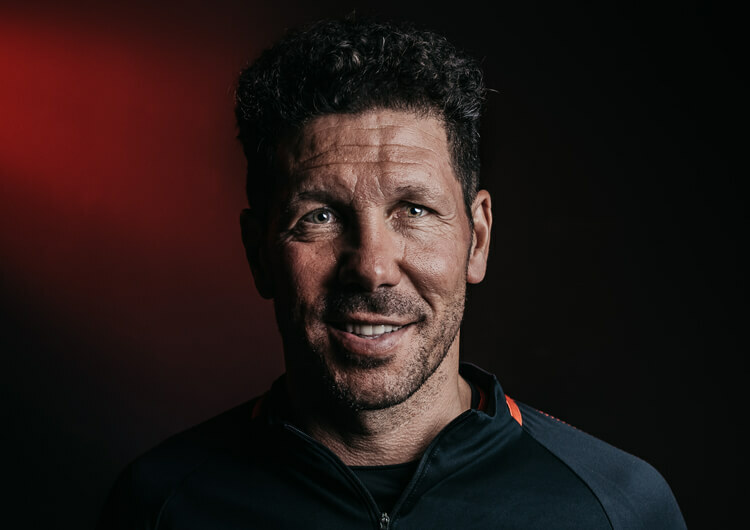 In a familiar approach, Barca tried to build possession from their defenders, using centre-backs Gerard Pique and Thomas Vermaelen to bring the ball towards the Valencia half, to allow their midfielders to position themselves further up the pitch. 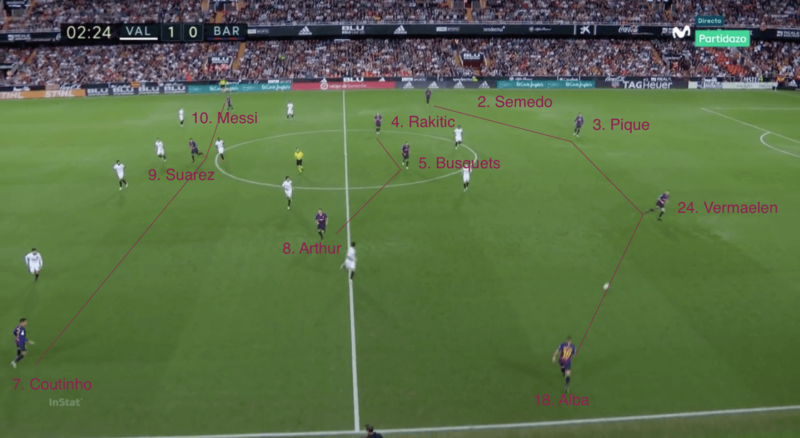 Against a rigid structure, they had to make good use of full-backs Nelson Semedo and Jordi Alba, who were positioned like wingers for large parts of the game. 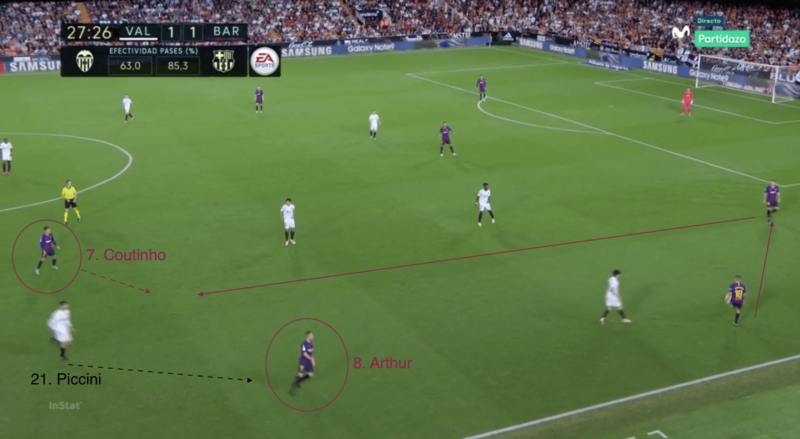 When they built from the left side, Arthur would take on the role of a false full-back, usually taking Cristiano Piccini with him – this allowed Coutinho to move inside and take up Arthur’s position on a midfield line to get on the ball and turn. The visitors had to display great patience in possession as they tried to find spaces to penetrate. One method of creating gaps was to entice their opponents’ forwards towards them before playing slightly longer passes backwards – with this tactic, they hoped the press would continue and larger spaces would become available between and beyond. 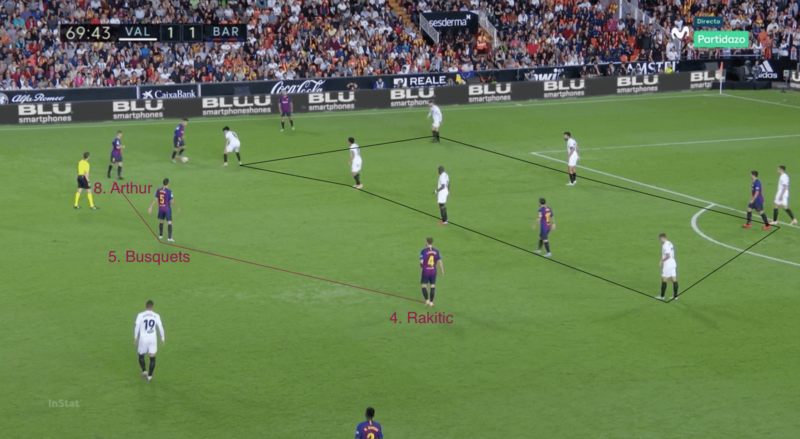 Despite spending large periods of time inside Valencia’s half, space in which to play was hugely limited, with the distance between Rakitic, Busquets and Arthur problematic. The trio were so close to one another that it was easier for the home side to remain compact and get out to press them. 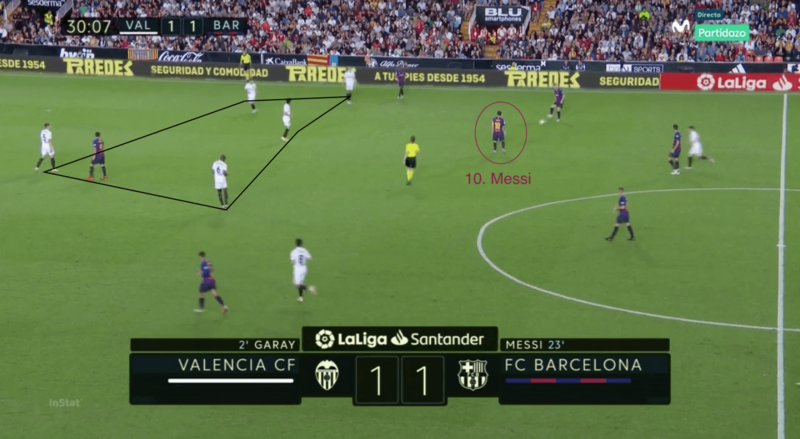 While the short distance may have been useful in allowing them to counter-press quickly, it didn’t encourage Valencia to stretch and create the gaps for Messi and Coutinho to operate in. It wasn’t until the final 15 minutes that the three midfielders operated over a wider area – it’s no surprise that, in this spell, they created more opportunities to play through their opponents and attack individuals one-on-one. They switched between different styles out of possession. 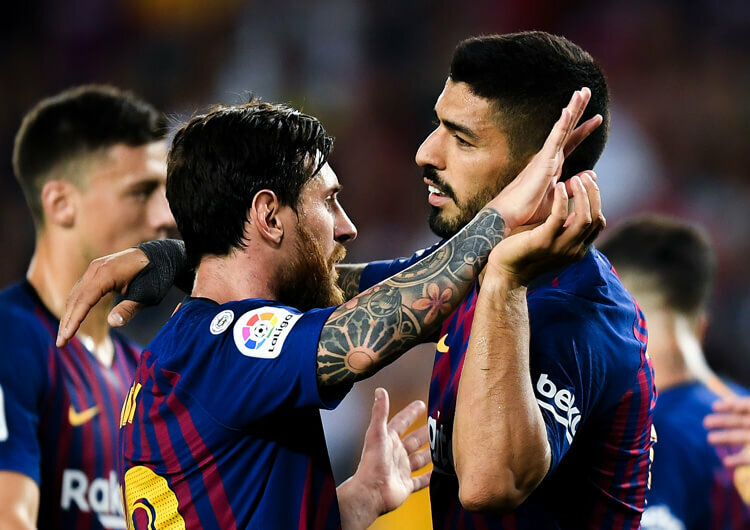 The general structure was a 4-4-2, with Messi and Suarez leading the line while Coutinho dropped in with Arthur, Busquets and Rakitic to form a midfield four. When Valencia played out from the back, they would initiate an aggressive high press – this included the midfielders jump-pressing when the ball was played backwards. This rarely resulted in a regain near the goal, but it did force their opponents into technical errors.  They could also be seen operating in a mid-block, with the line of engagement at the halfway line. 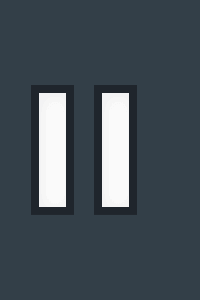 Their units would shuffle from side to side, waiting for a player to make a mistake before they could regain control of the ball. Their most common strategy, though, was to initiate an immediate counter-press upon losing possession, with the distance of the nearest man to the ball and the supporting players key in dictating the counter-press. 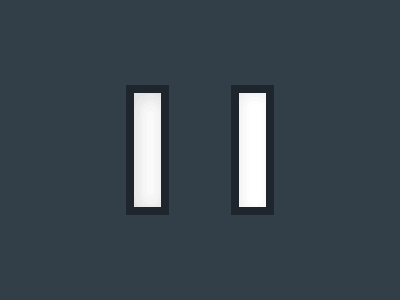 If the nearest man felt he was close enough, they would press; if he didn’t, they would drop off into their mid-block and wait for the next mistake or pressing trigger.